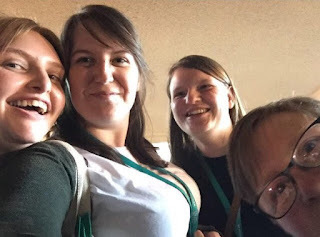 Similarly to last year, a few of the #OTalk crew - Myself (@OTontheTracks), Rachel (@ot_rach), Kirstie (@Kirstie_OT) and Helen (@Helen_OTUK) will be around at conference. Come say hello and chat with us, we'd love to speak to you and get to know you. 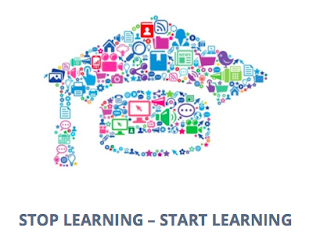 Feel free to ask us about the use of social media and we will try and help get you up to speed. 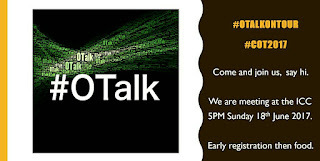 If you are arriving in Belfast over the weekend prior to conference, why not come meet up with the #OTalk team and community for some dinner and chat on the Sunday evening. Come along and join us for chat, food and some company. We will also have our Selfie board with us at various points during conference so why not have some fun and grab it and have your picture taken. 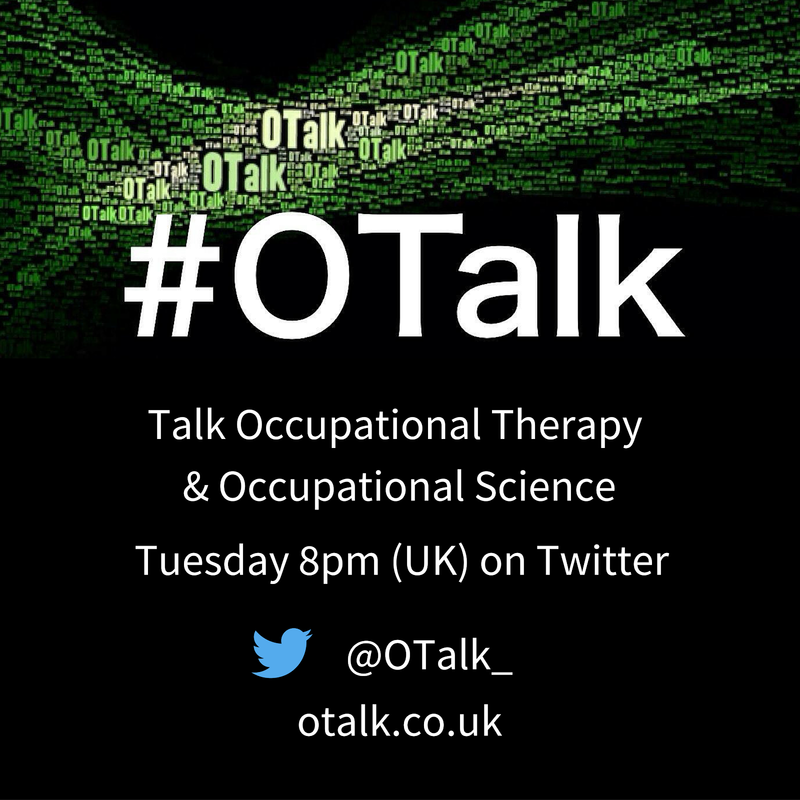 We'll be tweeting them from the @OTalk_ account throughout conference. 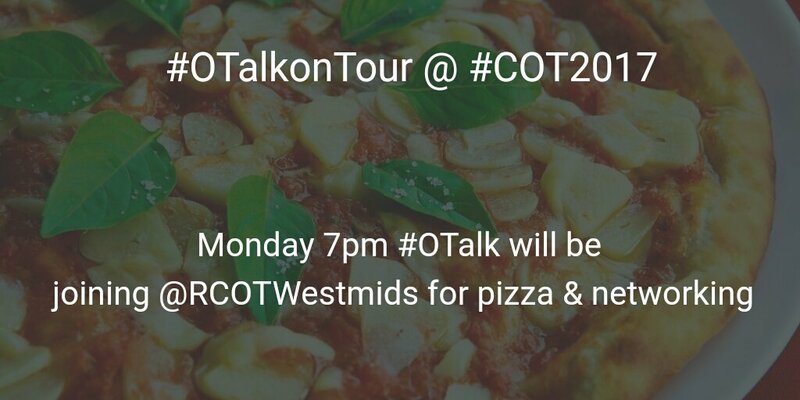 Remember to use the hashtag #OTalkonTour and tag us in your tweets. Session 21: 21st Century meaningful activity: Using social media as a way to engage. When: Tuesday morning 10:00-10:45 in Hall 1, Exhibition Theatre 1. Hopefully we will see you there. If you aren't at conference or if you are new to social media, there will be an #OTalk on the Tuesday evening hosted by Gill (@GillyGorry) from the #OTalk team. It will be a relaxed chat and worth checking out as a way to get the hang of the Tweet chats or just to catch up with whats' been happening at conference. 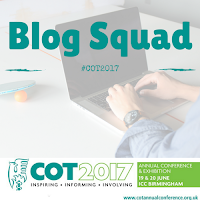 There is a team of conference attendees blogging their way through conference again as a way to share the conference experience with a wider scope of occupation therapists. 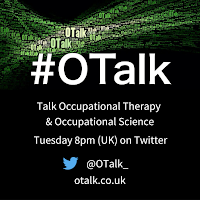 All the posts will be placed on the #OTalk Blog, during the conference so it's worth checking it out if you can't attend or even if you are there. There are a handful of the RCOT Scottish Eastern Committee at conference this year. 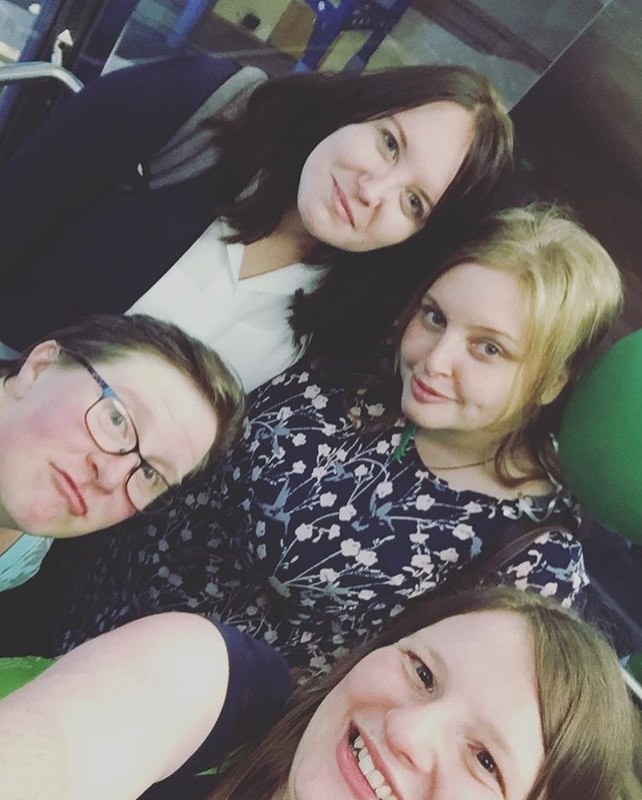 Look out for myself (@OTontheTracks), Hannah (@hannahcairns7), Charlie (@chungsongyau) and Heather who will be around and most likely on the RCOT stand at various points throughout. If you are based in the region and are tweeting/presenting/displaying a poster, please tag us in your tweets/photos as we would love to share any relevant news/information with others from the region. 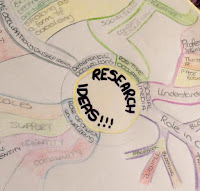 If you have been reading my blog since I was a student you may well have read about my research journey as I worked my way through the dissertation module of my MSc. 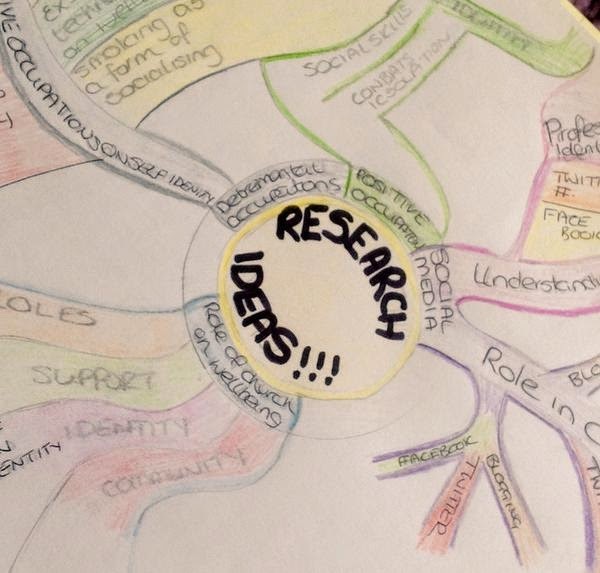 It feels so long ago in some ways that it all began with a mind map of ideas and what I thought was far to many questions. Ultimately I learned that through the process that having questions is the key to developing research and it is that desire for answers that drives us to partake in the research process. I never imagined when I started the research module with little confidence in my research and writing ability that I would ever conduct research and write something that would be good enough to be published. But here we are, nearly a year on from graduation and there is a published article. I'm incredibly thankful to the Occupational Therapy tutors at University of Cumbria and particularly my dissertation supervisor & personal tutor for fostering the drive and enthusiasm for research. Some of the introductions were streamed live on FB, the video can be accessed here. Janine Hackett has worked really hard in partnership the Scottish Eastern Committee to make the #80yrsOTEd event come together and her team of stewards on the day were vital to make the day run smoothly, so it felt right that she opened the days proceedings. Janine took the time to highlight the schedule for the day and also highlight the various exhibits that were open to the delegates to look around after the picnic lunch including the OT department and also the 'huts' which were used as teaching bases for students before education was moved over to Queen Margaret university. Hannah Cairns from the regional committee gave a brief introduction to the regional group and event. Ian McMillan's presentation was live streamed on Facebook and can be accessed here. 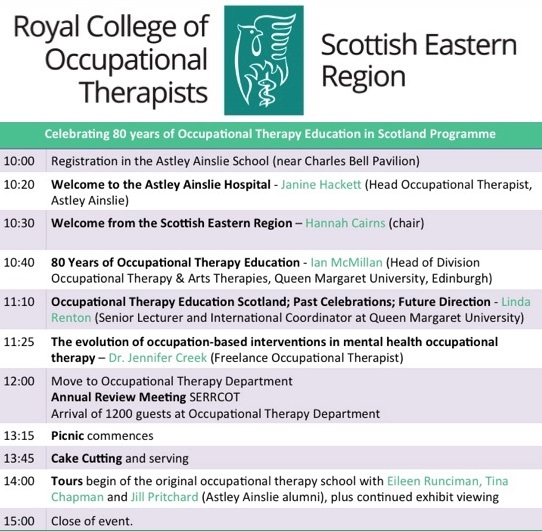 Ian shared the interesting history of the 80 years of Occupational Therapy eduction in Scotland and it was great to hear how far the education of new practitioners has come in the last 80 years from practical roots to a focus on research. As always Jennifer Creeks message was a fascinating and thought provoking one. I particularly enjoyed listening to Jennifer presentation as I'm currently based in a mental health setting. Our first Annual Review meeting as the RCOT Scottish Eastern Committee, which was expertly delivered by Hannah our committee chair. If you haven't been involved in a regional group before, you are welcome at our annual review meeting these are open to all RCOT registered Occupational Therapist in the region. Cake is always a winner isn't it, but it wouldn't have been a celebration without a cake or 3! 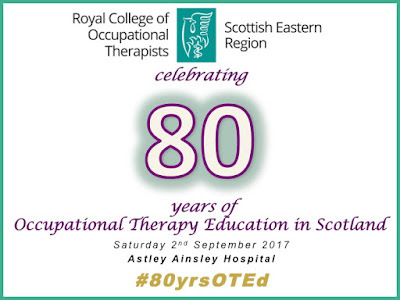 It was a pleasure to be part of hosting the 80 Years of OT education in Scotland event which celebrated it's roots in the Astley Ainsley hospital and then at Queen Margaret University but as Ian mentioned in his presentation 2017 also celebrated 40 years of OT education at Robert Gordon University in Aberdeen and 55 years of OT education at Glasgow Caledonian University in Glasgow. This was one of my favourite parts of the day, because i'm an explorer, and I love history, I also love education and unsurprisingly love occupational therapy... so combining all these aspects was bound to be fun for me. I loved hearing the stories and memories of the occupational therapists that trained in AAH and also that worked there! This event also reminded me how small the world of occupational therapy is and how often our paths meet. It was great to network not only with past colleagues, but with students from my university and with occupational therapists who I have learnt from and been inspired by. On the 27th July 2017 the Royal College of Occupational Therapists hosted a new graduate networking event at their head office in London. I was lucky enough to be allocated a space at the event and eagerly set my alarm for 4am so that I could travel down to London in time for the start of the event. 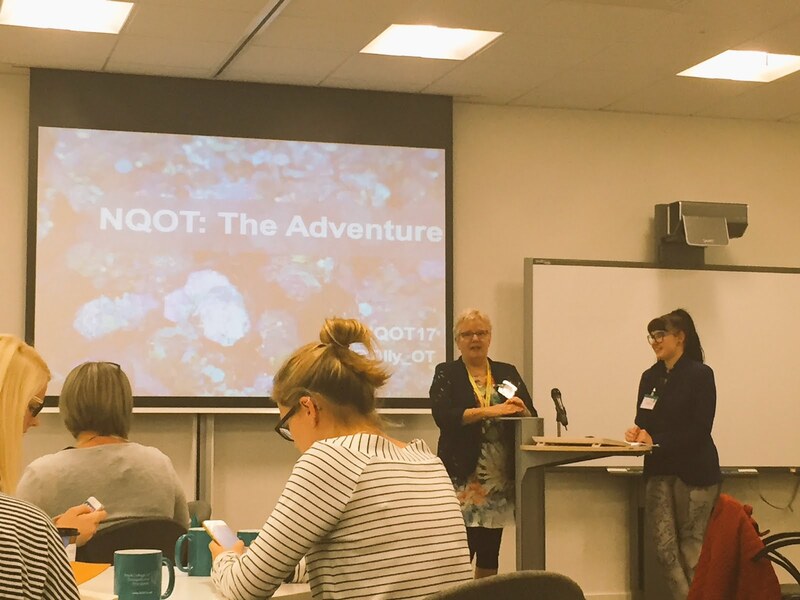 There a few ways to catch up on the event such as following the hashtag on twitter: #NQOT17 or following the Royal College's posts on Facebook. NB: Views and reflections are my own but will have been impacted by discussions and interactions throughout the day. I have used tweets to help illustrate thoughts and views and where possible I have referenced these at the end of the blog post. Dr Stephanie Tempest introduced us to the new Career Development Framework that has been put together. The resource has been developed to be used by those within the occupational therapy professions as all levels from support worker right up to senior manager/researcher. It uses the 4 pillars of practice (Leadership, Professional Practice, Evidence, Research and Development and Facilitation of Learning) and charts them against the 9 leaves of Career Framework levels. 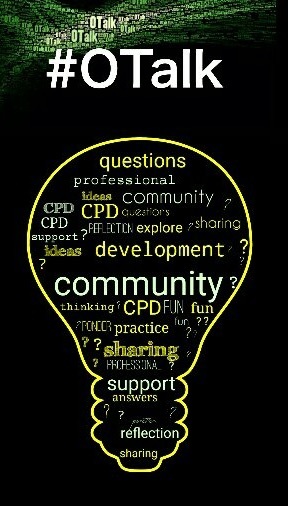 Continuing professional development (CPD) is a crucial component of safe and effective practice. we need to engage in it to get the best outcomes for the individuals that we work with. But ultimately it is just learning and so there will be opportunities within our everyday practice it doesn't mean we need to be signing up for courses all the time to be improving our practice. We can use the resources and people available to us within the workplace. Ask people and ACTIVELY listen to the feedback and this can support our development. The framework can be used on an individual level, service level, commissioner level and as profession as a whole which sounds promising. I particularly liked that there is no standard starting point in the framework because we all come from different start points and that is completely okay. It values that we all have different backgrounds and that this will impact on where we start our development. This session was also live steamed on Facebook so if you are a new grad or even if you have been qualified for years check it out for an introduction to the new framework. The stream had a few technical issues but can be seen in three parts: PART ONE | PART TWO | PART THREE. You can also download a copy of the slides here. 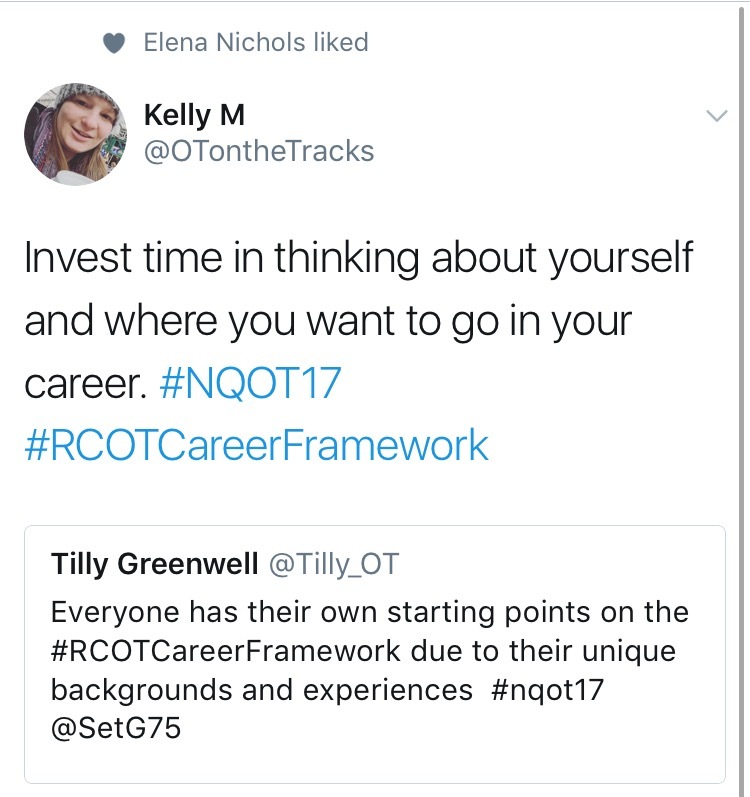 If you do watch the stream and want to tweet about it the hashtag for this is #RCOTCareerFramework. The 4 pillars are something I relatively familiar with from it's use with my workplace, but it was good to have time to reflect on where we felt we were at the start of our careers. I am looking forward to using it to track and plan my development as an Occupational Therapist. Another point I liked was the fact it acknowledges that we will move up and down on the pillars depending on our post and stage of our career but that charting where we are helps us to continue to develop the areas we need too throughout the process. The full Career Development Framework will be available from September and will include an interactive PDF, webpages, hardcopy implementation guide and resources to help you use it in practice and initial feedback has been very positive. So keep your eyes peeled on the Royal College of Occupational Therapists website and social media sites for updates on it's release. The Library team introduced the resources they provide to members of RCOT both in physical form within the library at RCOT HQ and online through the website. Did you know for example that you can request a photocopy of a chapter of a resource that the College only have in a physical format? They can also do literature searches for you. The new RCOT website has been live of a little while through, but this is only the first stage of changes so look out for additional resources being added once these next stages are complete. 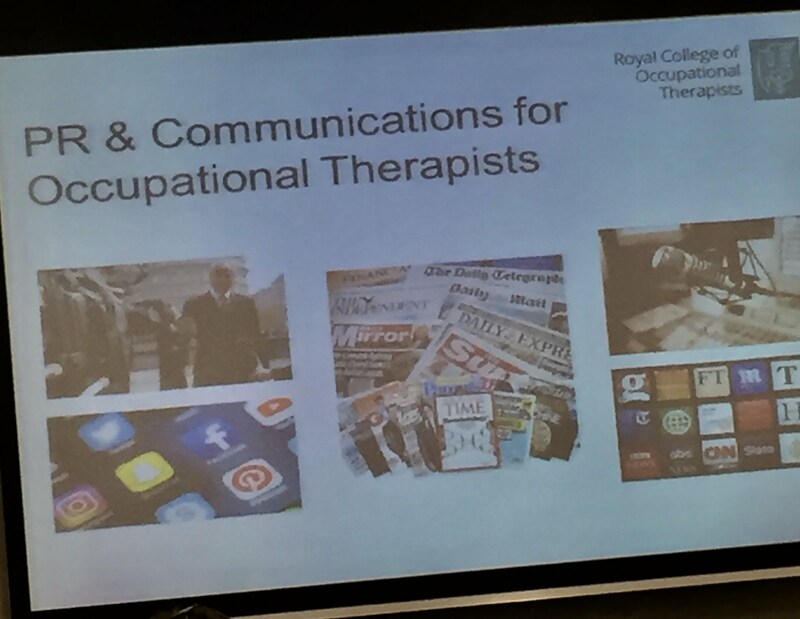 Louise Cusack (UK Regional and Specialist Sections Manager) introduced us to the branches of the Royal College of Occupational Therapists - Specialist Sections and Regional Groups. If you didn't know already but every member of RCOT is part of a regional group. The address & postcode you used when you registered with RCOT its used to determine this. For example if you have EH postcode you would be part of the Scottish Eastern region. Being part of your regional group has some great advantages, such as increasing your networks, enhancing your communication skills, being part of developing and supporting CPD events in your area. 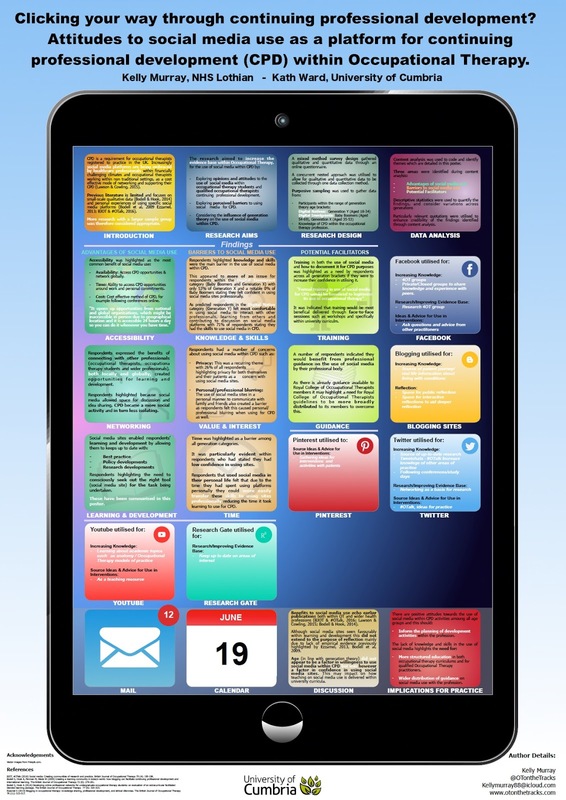 It also aids your understanding of policy and RCOT campaign focuses going on within your area and nationally. The other branch of RCOT is the Specialist Sections which are open to members for a small additional charge to their membership and provide spaces to enhance your knowledge on particular areas of practice. Currently RCOT has around 11 specialist sections including HIV, Oncology and Palliative Care, Mental Health and Older People for example. Most specialist sections have an online presence, and send out regular newsletters keeping members up to date on recent relevant research, news and events. Most of the Specialist sections also host study days/conferences for their members which are a great resource to increase knowledge and also network with others working in similar specialists to you. Anne Keen introduced us to the role of the Professional Practice Team and how they can help us throughout our career. 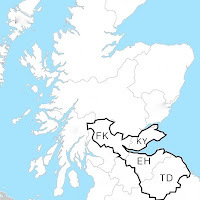 The team is made up of the Specialist Sections, Regional Groups (discussed above), Professional Advisers and the Professional Practice Enquires Service. The Professional Practice Enquiries Service is there to deal with enquires relevant to all aspects of our day to day practice in the workplace. It is a members benefit and is a great reason to become an RCOT member. The service can be accessed by phone or email. Anne Highlighted the Code of Ethics is the first go to guide for all aspects of professional practice but we know in reality day to day practice isn't always as simple as that and that is why the Professional Practice team are there to help and will respond with a tailed response that is relevant to the person and service asking. The Professional Practice team are there to support us within the workplace and the professional advisers are a brilliant resource if you have quires relevant to a specific specialist area of practice for example regarding children and young people or mental health. A key take home from this session was the importance of occupation in that we do and the service we provide. Thats the area we are experts in so that needs to be at the centre of what we do in out day to day work with our clients. Crucially because this is our speciality we need to stop abbreviating what we do because how then can we get annoyed that people don't understand what we do. We are Occupational Therapists not just "OTs". Pauline Macdonald discussed the range of resources RCOT provide to aid our evidences based practice such as hot topics and RCOT fact sheets which summarise relevant evidence on topics. There is upcoming resources being produced to give occupational therapists further information about AMPs, TOMS and COPM as outcome measures. There is also a research newsletter you can sign up for by emailing: Lesley.gleaves@rcot.co.uk, which is well worth signing up for to keep up to date. 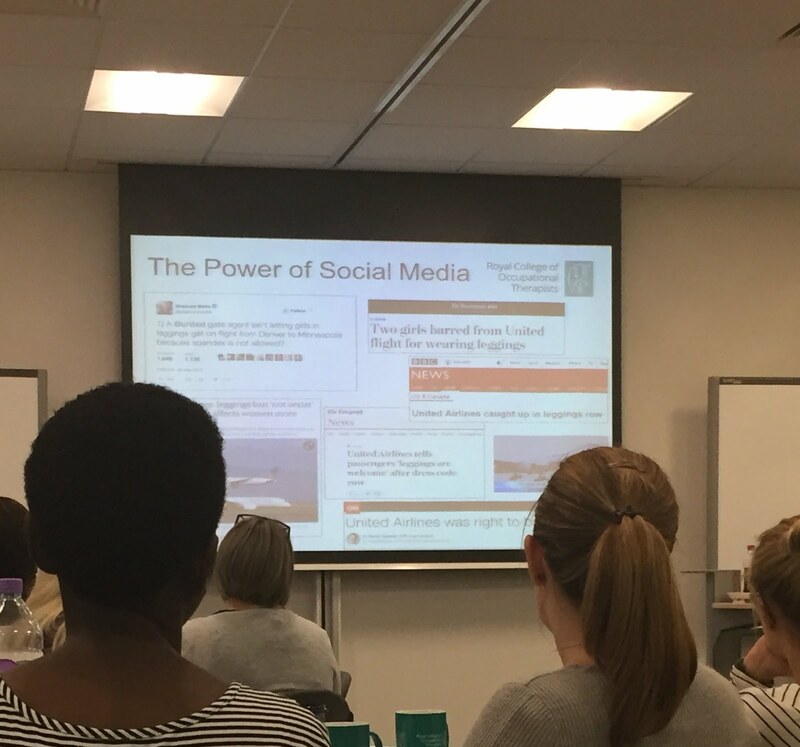 This session focused on a mix of the use of social media to increase publicity and also on the RCOT's Living not Existing Campaign. Andrew introduced us to the power of social media in sharing a story but questioned are we aware of the story we are telling. Do we know all the facts and will it have benefit to the profession by sharing it? - Would you want whatever you are tweeting on the front page of the Daily Mail? - Would you be embarrassed if your mum saw your post? - If you are in doubt, Don't post it. Andrew encouraged occupational therapists to make friends with your organisations press officer and run things by them before publishing anything that could by impacting the organisation we work for. He also encouraged us to take time each week to think and reflect about the stories we can tell showing the #ValueofOT and how we could go about sharing these. The Campaign's next (September 2018) focus will consider the role of Occupational Therapists in supporting individuals with mental health difficulties. Tilly joined us to share her experiences of the first year as a newly qualified occupational therapist. I was completely reneged in this session, not just because she used Harry Potter quotes to illustrate her journey. She broached the age old question (and one very relevant to me), do you take any job or do you wait out for a job in the area you want to specialise in? Ultimately it is a personal response and so individually crucial when seeking out employment once qualified. 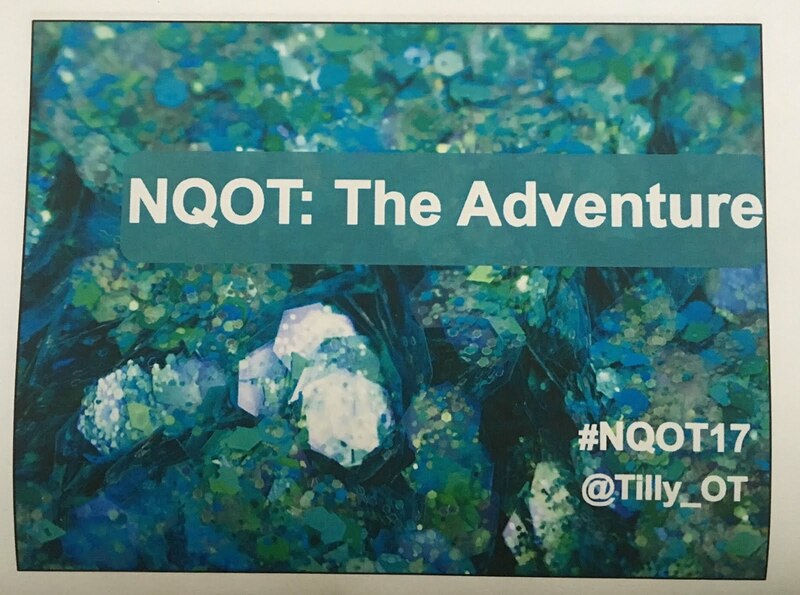 Tilly shared her challenges of being a newly qualified Occupational Therapist such as that lingering feeling of not knowing what you are doing. When you consider the transitional experience from experienced student to novice practitioner, it is understandable that this is a compounding feeling that we focus on over and over as a new grad. Ultimately as Tilly mentioned it is beneficial to use time to reflect on the experience of this transition if we are to really understand and move past those feelings as we develop our practice. I found Tilly's presentation really helpful and could relate to a lot of the things she was saying as a new graduate. It can often be hard to move on when things haven't turned out great but that doesn't mean we should be moving forward. 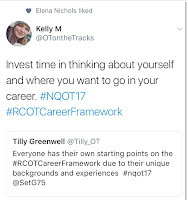 Tilly talked positively and encouraged us as new grads to get involved with RCOT and other development activities to open up opportunities and assist in supporting our professional networks and in turn building our professional confidence. Finally just to say another big thank you to Tilly for sharing her experiences as I know she was a tiny wee bit nervous about the experience. Overall summary of the day: Great experience and If you get a chance to go along next year, jump at the opportunity. Also a massive thank you to Maureen Shiells and the rest of the Royal College of Occupational Therapists team for being so welcoming and generally making the day run smoothly. 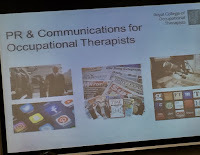 Cusack L (2017) Introduction to Royal College of Occupational Therapist's Branches [World Cafe Session at Royal College of Occupational Therapists New Graduate Networking Event], London . 27th July. Greenwell N (2017) The First Year [Presentation at Royal College of Occupational Therapists New Graduate Networking Event], London . 27th July. Keen A (2017) Introduction to Professional Practice Team [World Cafe Session at Royal College of Occupational Therapists New Graduate Networking Event], London . 27th July. Macdonald P (2017) Introduction to how Royal College of Occupational Therapists can support Evidence Based Practice [World Cafe Session at Royal College of Occupational Therapists New Graduate Networking Event], London . 27th July. Sharratt A (2017) Media and Learning [Presentation at Royal College of Occupational Therapists New Graduate Networking Event], London . 27th July. 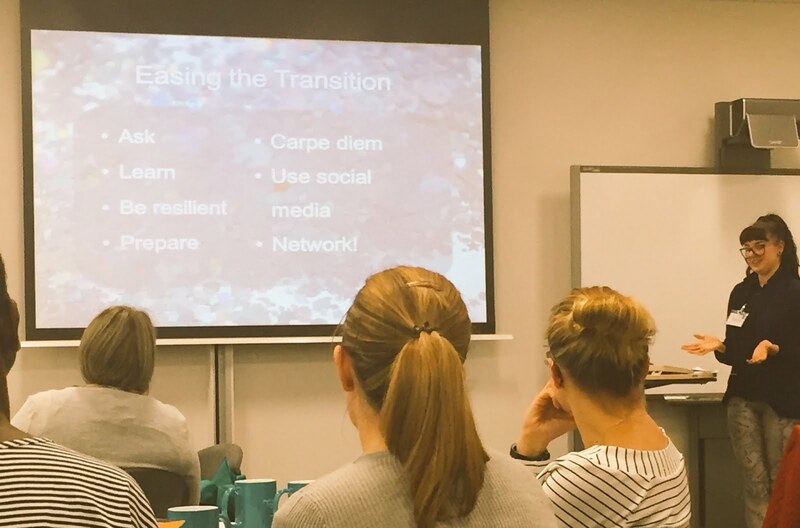 Tempest S(2017) Planning your next learning steps with the career Framework [Presentation at Royal College of Occupational Therapists New Graduate Networking Event], London . 27th July. 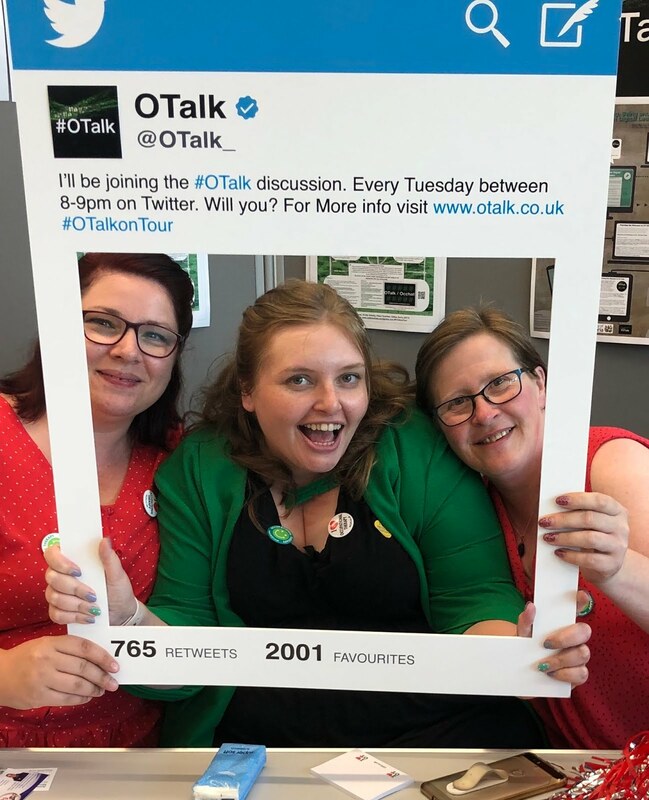 A few of the #OTalk crew [Myself (@OTontheTracks), Rachel (@ot_rach), Kirstie (@KLO2_KAY) and Helen (@Helen_OTUK) will be around at conference this year, come chat with us, we'd love to speak to you and get to know you. If you are arriving in Birmingham on Sunday and are looking for something to do or some company for dinner. We are planning to meet up at 17:00 at the Birmingham ICC for early registration and then to grab some food. Come along and join us if you'd like to! We will also be around at the Royal College of Occupational Therapists West Midlands (@RCOTWestMids) Networking event on the Monday night at Pizza Express. 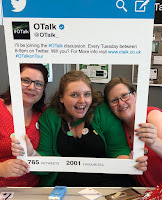 Our normal Tuesday #OTalk (8pm-9pm) will be still be happening with the lovely Gill (@GillyGorry) hosting, while the rest of team catch our trains home. 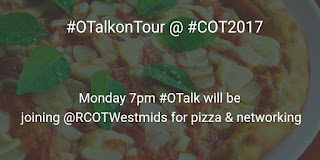 She will be hiding a Social Media round up of conference, so if you can get online, please join in and share your conference highlights with the wider of the #OTalk community. I have a poster in the display hall (Poster 26). Come along and check out the findings of my research which focused on attitudes to social media use as a platform for CPD. If you aren't at conference or would like to take another look in your own time, you can find a copy here. 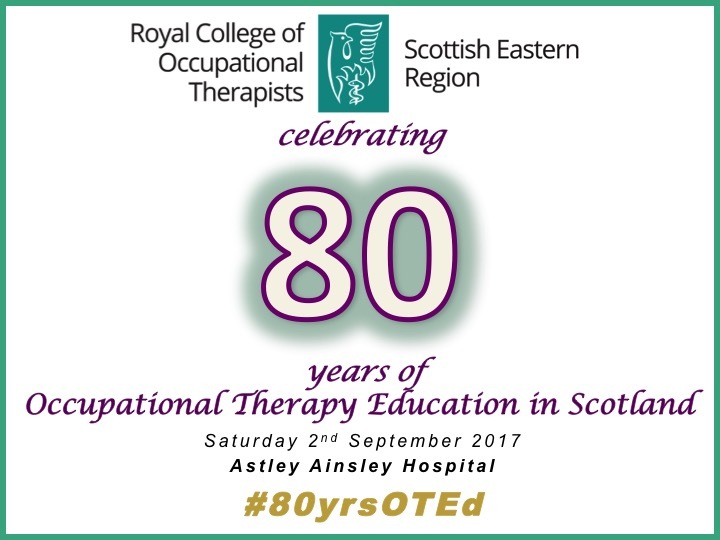 Are you an Occupational Therapist from the Scottish Eastern region attending conference? If so feel free to come say Hi to me (@OTontheTracks) and Andrea (@Andrea14OT) from the Scottish Eastern Committee who are attending the conference. We will be tweeting on both our own and the Scottish Eastern Twitter account (@COTScotEastern) throughout the event. If you are based in the region and are tweeting/presenting/displaying a poster, please tag us in your tweets/photos as we would love to share any relevant news/information with other from the region. If you are following #COT2017 from home/work or even if you are there in person, check out the #COT2017 Blog Squad posts, which will be going live on the #OTalk site throughout the conference. There is a great bunch of delegates at different stages of their career, signed up to share their conference experience with others. Here is the intro blog, if you are interested in learning more. To find an updated list of posts click here. 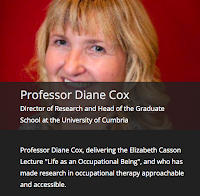 Lastly but by no means least, if you are at conference make sure you get a seat to hear Prof Diane Cox deliver the Elizabeth Casson Lecture. She is one incredibly inspiring lady, that I have had the pleasure of hearing talk about research whilst at university. She is a brilliant speaker and you would me silly to miss her if you are at #COT2017.